SCP-300-J in its default form. Special Containment Procedures: SCP-300-J remains operational up to temperatures of 4000 Kelvin, as well as being highly resistant to damage. This, coupled with the memetic aspects, has led the Foundation to make the extremely hard decision to destroy SCP-300-J with extreme prejudice. Researchers previously exposed to SCP-300-J are not to assist in the destruction of SCP-300-J. For the time being, SCP-300-J is to be stored in a 3 x 3 Meter Level 2 Memetic Hazard Container lined with Telekill Alloy. No persons are to be allowed within SCP-300-J's containment unit. Description: SCP-300-J in its default form is a cube measuring 32 Centimeters along each side. Each face has a small red figure, in the shape of a heart, inlaid upon it. SCP-300-J's anomalous properties manifest when a sentient creature that has been without the company of other creatures for an extended period, namely when a person has been in isolation. The cube then transforms itself into a form that the person will mentally anthropomorphise as a "friend". The shape varies on each trigger of the anomalous properties. Following this, the extremely lonely person will begin to speak to the cube, ignoring all human contact. SCP-300-J came into the care of the foundation in 19██, following C███ J██████'s Transdimensional Testing Initiative, the largest Con Game in the history of the multiverse. 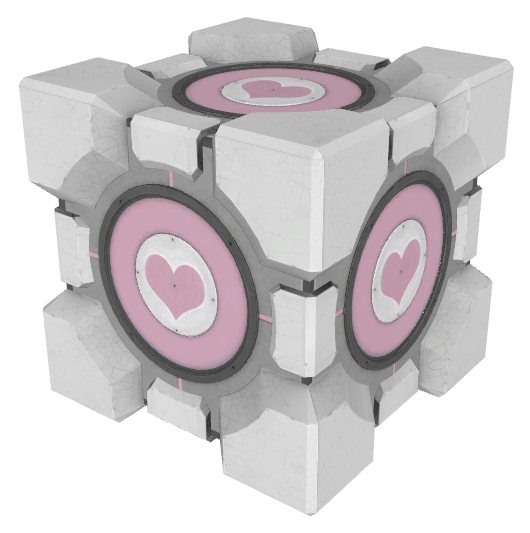 Addendum: Dr. Gla███'s claim that "The Weighted Companion Cube will never threaten to stab you, and in fact, cannot speak." has been found to be of questionable accuracy, especially given the reaction that Agent C████ had upon her interaction with the cube in her assigned test. Human testing has therefore been discontinued by order of O5-██. The following is the log of experiments performed upon 300-J by Dr. Lauzon upon acquisition. Form Taken: Large stuffed Ukulele. Subsequent Events: Dr. Clef nearly immediately cuddled with it, affectionately calling it 'Susan', and repeatedly asked to take it home with him. Agents ██████ and ████████ were forced to remove Clef from SCP-300-J before anything more severe happened. Subject: D-56008, Female, Convicted of Molestation. Form Taken: A large phallic object made out of solid rubber, consistent with a massive masturbatory aid. Subsequent Events: [DATA EXPUNGED] Clean up is still ongoing. Form Taken: Object remained in its original form. Subsequent Events: Agent C████ recognized the cube from her past. Research into exactly what this connection was yielded no useful information. Form Taken: A stuffed teddy bear reminiscent of SCP-053's appearance. Subsequent Events: Somewhat predictably, 682 cuddled with 300-J, until it discovered that 300-J was really not 053, at which point it proceeded to [DATA EXPUNGED], resulting in [DATA EXPUNGED]. Subsequent Events: [DATA EXPUNGED] D-45073 was later discovered to have used a similar knife in his murder of R████ T███████ and his wife in 20██.